My daughter Strawberry loves finding her name on papers and notes around the house. Whenever she sees a “C”, she thinks it must be her name (her real name begins with “C”). She also recognizes “Mom” and “Dad,” and now she’s finding her brother’s name. (His name starts with a “P” and she loves to say “Popcorn”! when she finds his name.) 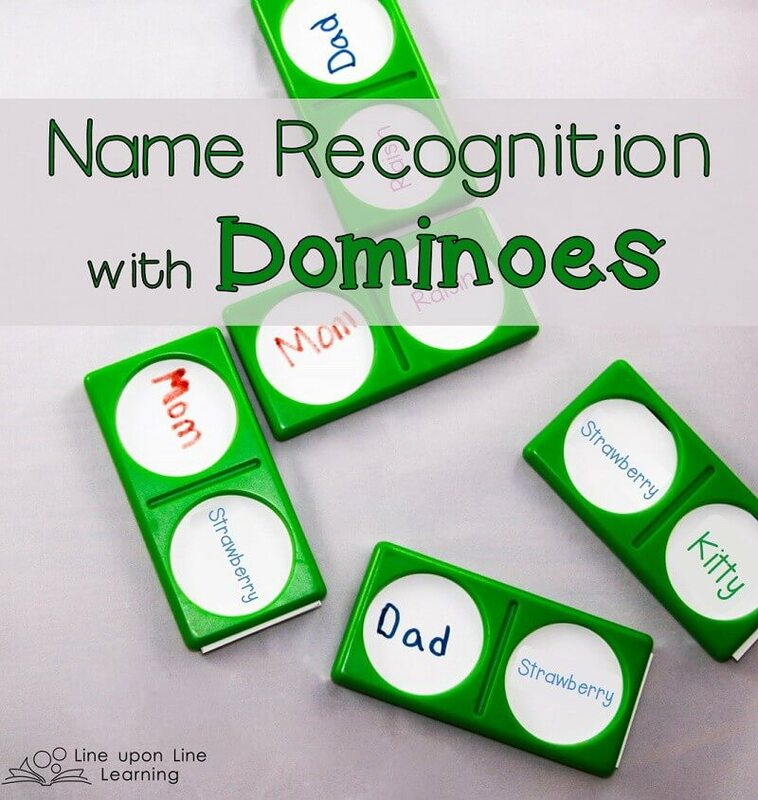 This week I decided to take our super-fun Leap Frog dominoes and make a game for name recognition with dominoes, using the names of our family members. Each of the included dominoes cards has about five matches, so this was perfect, since our family has five members in it! 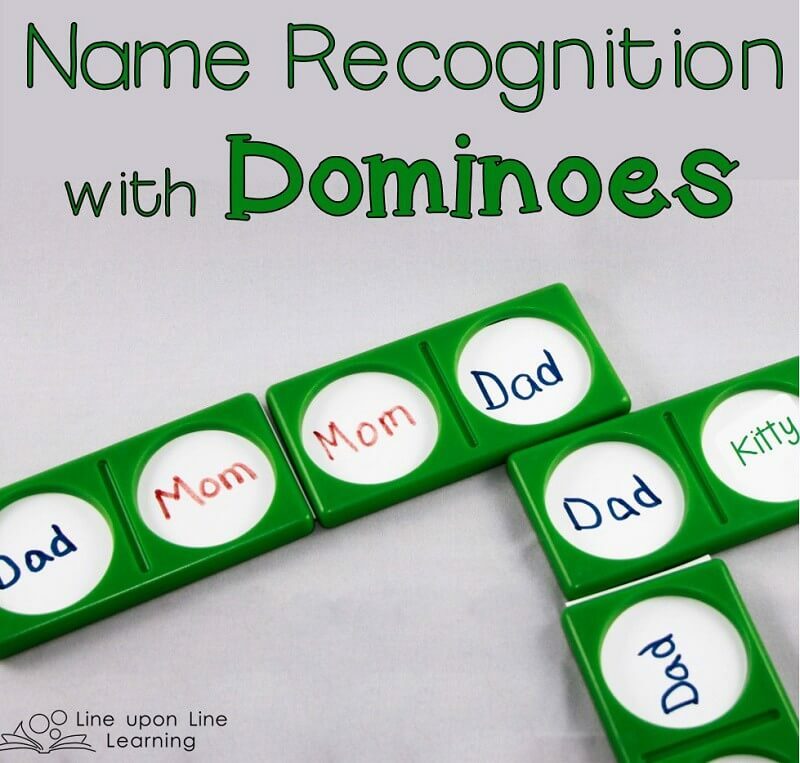 To make this game yourself, you need thick card stock, markers in five colors, and the Leap Frog Dominoes frames (the game itself includes color matching, number matching, and rhyming word matching cards, among others, which are also fun!). I suppose you could just play with cards without the frames, but I love the frames, so that’s what I used. I started by cutting the card stock in the same size as the Leap Frog dominoes cards, about 4 inches by 1.75 inches. Then, I put each card in the domino frames and wrote the names on the cards. I chose to write each family member’s name in a different color marker. This way, Strawberry could match by the first letter of the name, or for the tricky names (baby Kitty’s real name begins with M, just like “Mom” does!) she could also match by color. I don’t expect Strawberry to learn to read all of these names out of context at this point. She is only 4, and she is still learning basic phonics and mostly enjoys naming letters and playing games with them. But for her, it was so much fun to put the names of the people she loves most into a game, and since there were first letters and colors to match, she loved the simple challenge to match them together. She loved making a domino train with the names of those in her family! 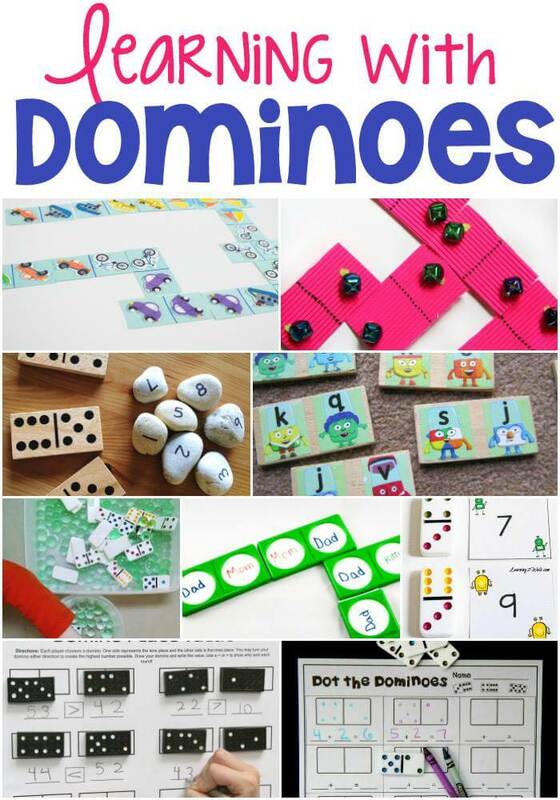 See other ideas for learning with dominoes at the sites below!